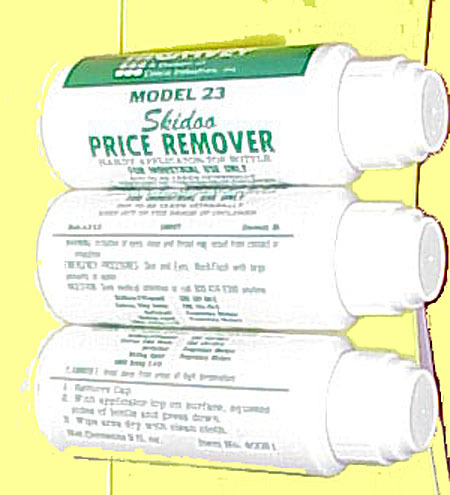 23 Skidoo Ink remover 2 oz. This might allow you to read the information on the bottle. This Garvey 2 fluid oz. 23 Skidoo comes in a handy applicator bottle with a removable cap to expose the applicator pad. It works like a roll-on deodorant without the ball. Keep away from skin & eyes. If exposed to skin or eyes, wash & flush with large amounts of water. Not to be taken internally. Keep away from children. 6 bottles per chipboard box & 1 gross per case. Please order in multiples of six 2 oz. bottles & a minimum of 12 bottles. Price is per 2oz bottle.